The final round if the 2018 MX-5 CUP Championship was run Sunday 9 Sept on the GP Circuit SMP. We had 16 entries a number of whom running in their first round. The three races were dominated by young Zac Raddatz in his first showing taking pole and all three races by a considerable margin. Coming in to round 6 we had 4 points separating the top three racers competing for the championship. All three had competed in each round so they all had the opportunity to drop their lowest scoring round which meant the championship was wide open. 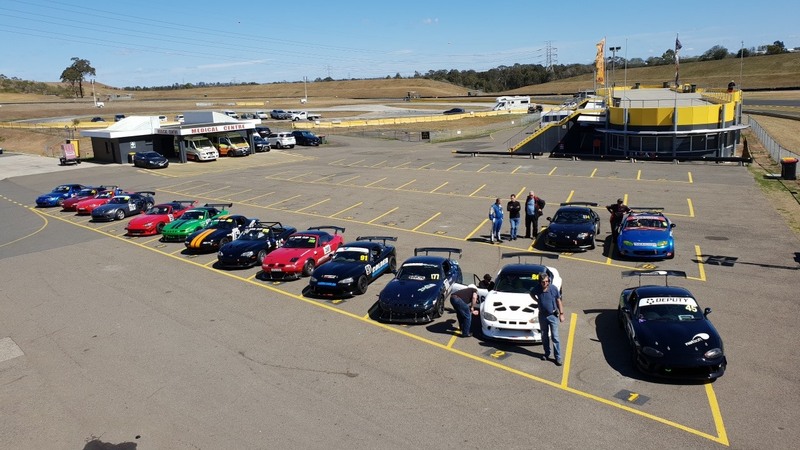 With consistent performances throughout the year and often competing is a highly competitive class, Kerry Smith competing in the Track School MX-5 finished the series in 3rd place with 101 points. The highlight of the 2018 season has to be the ongoing battle between Stuart McFadyen and Ben Cathcart. They went head to head all year with some really competitive and clean racing which is what the Cup is all about. Well done fellas. Stuart held a 4 point lead coming into the final round but unfortunately suffered mechanical issues during qualifying meaning he has to sit out the three races and watch from the sideline unable to improve on his 105 point tally. Ben Cathcart I know would have much preferred to have his buddy on the track to go wheel to wheel for the championship. Ben had a great round taking out first place with 24 points and after dropping his worst round he increased his points tally to 109 points to take out the 2018 Championship. Congratulations to Kerry, Stuart and Ben. Paul Nudd will be taking the reins for the 2019 Season. With a number of competitors showing interest to joining in or return to the fold I believe 2019 can be the best series to date. Thank you everyone for your support over the past couple of seasons. See you at the circuit.